[dropcap style=”font-size: 60px; color: #0099FF;”]E[/dropcap]very fall, Vivace Productions, Inc. hosts the Annual Collegiate Marching Band Festival at Birney Crum Stadium, located in Allentown, PA. Over the past sixteen years, it has become a very popular event, marked on the calendars of many college band directors. Bands across the East Coast travel to Allentown to perform for hundreds of people, as well as see a variety of collegiate bands perform. For me, Allentown is especially meaningful. The Zeta Upsilon chapter of Tau Beta Sigma and the Eta Rho chapter of Kappa Kappa Psi, located at West Chester University of Pennsylvania, serve as volunteers for Vivace Productions at the band festival. It’s one of the finest ways we can give back to our band. My Sisters and Brothers are seen everywhere at the event—selling tickets, programs, and t-shirts, manning gates, directing traffic, hosting bands, and much more. We do our best to serve these marching bands, as well as audience members and Vivace Productions. While standing at the top of Birney Crum Stadium this past September on the day of the festival, I could tell it was going a prominent memory of my junior year. I had been looking forward to serving at Allentown since the year prior, when I was still fairly new to the Sisterhood. I kept thinking it couldn’t have been a better day for a marching band festival. The sky look as if someone gave it a fresh coat of paint—there was not a cloud to be seen. The sun shone brightly and a breeze floated gently through the air. As the day progressed and my Sisters and Brothers began to serve, I felt so proud to be a part of Tau Beta Sigma for a third year. Allentown helps me to show the enthusiasm and love I have for marching band. It’s one on the times I feel like a Sister the most—when I’m given the opportunity to work alongside my Sisters and Brothers, promoting music and service, as well as strengthening the bond we share. The Sisters and Brothers of Zeta Upsilon and Eta Rho aren’t the only ones in attendance at Allentown. Various members of chapters, primarily from the Northeast District, appear wearing Greek letters around the stadium. They travel as members of the band, displaying not only their loyalty to their university, but to Tau Beta Sigma and Kappa Kappa Psi as well. It’s hard not to run into a Sister or Brother at Allentown, and it’s one of the parts I love the most. I love seeing Sisters at Allentown in Greek letters. It gives me the opportunity to talk to them and know the connection we have beyond basic interaction. Often times there are so many Sisters and Brothers at Allentown, it seems as if the NED decided to hold District Convention in the fall as well as the spring. This festival is more than a convention, however. I look forward to more than just service, marching band, and meeting Sisters and Brothers. The Northeast District has a tradition at Allentown, which allows us, as Sisters and Brothers, to show the love we have for music, beyond performing in a marching band. After the final band finishes their performance and is headed towards their buses, Sisters and Brothers gather onto the field. Some are in their band’s uniform, while some are in Greek letters and jeans. Some know each other from other schools and chapters, while for others, it is brand new. After a few minutes of chatting, Sisters of Tau Beta Sigma form a ring around all Membership Candidates. 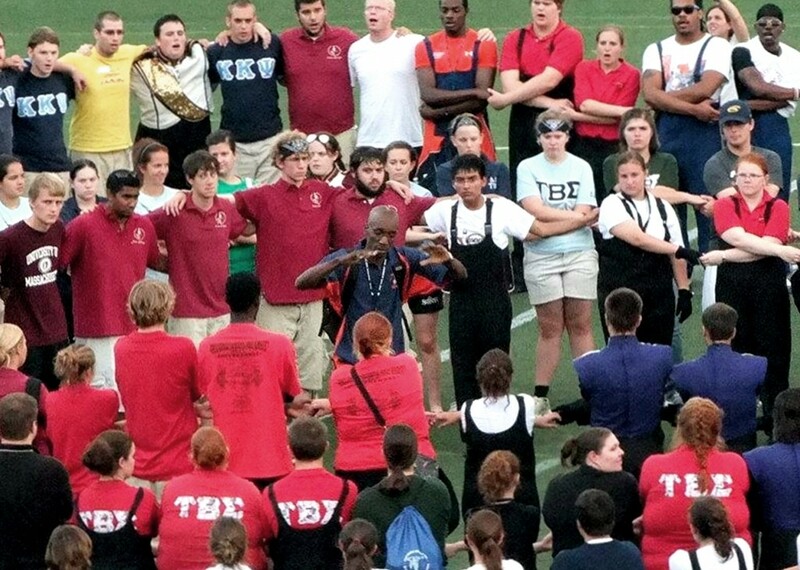 Brothers of Kappa Kappa Psi then form a circle around their Sisters. Arms are linked and hands are held as the silence grows. After a moment, I heard a Sister humming a note. It’s a note I’ve heard before and I begin to hum it too. I close my eyes and listen as more people join in this low hum. After a minute, I look at this Sister; she counts with a nod, “One, Two, Three,” and the Sisters of Tau Beta Sigma begin to sing our hymn. I close my eyes again and take in the music. I feel the Sister to my right squeeze my hand as I lean my head on her shoulder. I begin to cry, not because I’m sad, but because I feel so blessed to be considered a part of such an amazing group of people. I open my eyes, with my face still damp with tears, and begin to look around the circle. I see Sisters smiling at me. They understand why I’m crying, because they share my feelings. Our hymn ends and it grows quiet. After a moment, a Brother begins to hum, and it isn’t long before they start to sing. Energy builds among all of us as they begin to sway to their hymn. I take a moment to breathe and remember why we are at Allentown: to share our love for music with everyone one around us. I look up into the stands and see people standing there, watching. These people see us as two organizations, but many don’t understand how meaningful this experience is. The connection that we share as Sisters and Brothers is unlike any other. To know that anywhere I go, I can find a Sister or Brother to connect with is beyond fraternity. It is a lifelong experience created by our passion for music and service. And it’s not just this way for me. It’s something we all share as Sisters and Brothers in the bond. Previous story You’re an Alumnus… Now What?